For the past several years, I’ve had problems successfully growing tomatoes bigger than cherry tomatoes. This year was no exception. Whether it was the cool weather or the increasing shade in my maturing yard, my tomatoes would grow and maybe set fruit but the fruit simply wouldn’t ripen. But finally, in September, one variety—Mr. Stripey—showed some promise by turning color. The few I tasted were delicious. Success at last! But then I noticed that each tomato, without fail, had concentric cracks around each stem. Well, this was a disappointing turn of events that I hadn’t seen before. 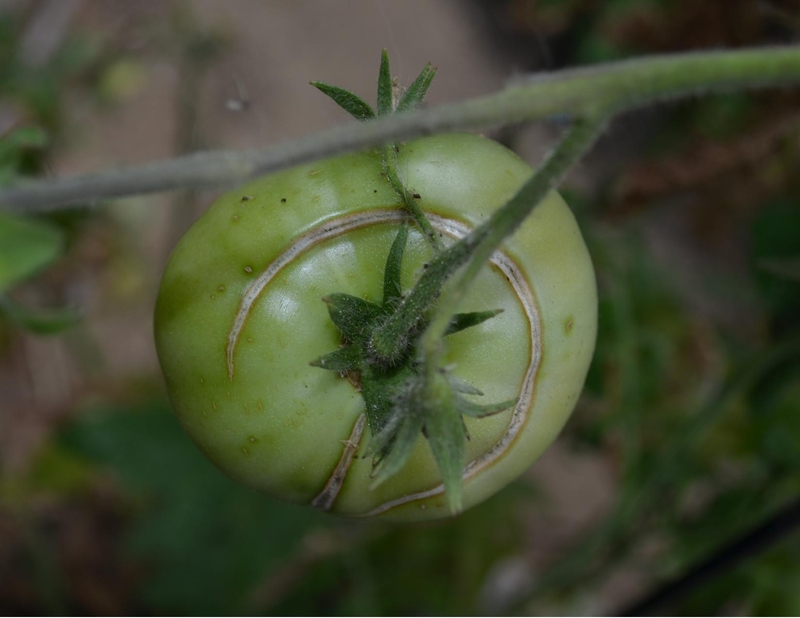 After a little research, I learned that these cracks, also known as “growth cracks,” are associated with the tomato’s growing conditions. Concentric cracks circle the top of the tomato around the stem while radial cracks extend in a straight line down the side of the tomato from the stem. Both types of cracks are caused when a plant receives too much water after a dry spell, either through excessive watering or after a rainy period. In essence, the plant receives too much water too fast, causing the interior of the tomato to expand too fast for its skin to stretch enough. The skin then cracks to relieve the pressure. My plants are watered regularly by timed drip irrigation, so I was a little surprised to learn that this system could result in excessive watering (if anything, I’ve been fairly sure that they get under-watered.) 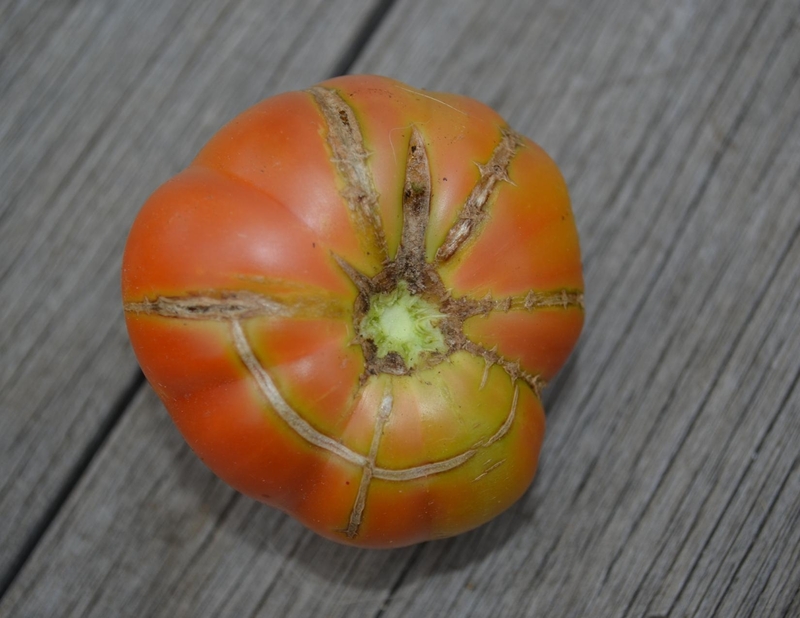 But then I learned that some beefsteak-type varieties, like my Mr. Stripey, are prone to cracking. Perhaps that explains it! Cracked tomatoes are still edible, but are prone to rot or disease setting in quickly. The cracked portion can simply be cut away. In my case, once the cracking appeared, I never was able to beat the rot before picking the tomato. What can I do to avoid this problem next year? First, try a crack-resistant variety with more elastic skin (e.g., Early Girl, Jet star, Mountain Spring or Mountain Fresh). Second, mulch plants once they are established to help retain soil moisture. Third, pay closer attention to my plants’ irrigation needs, particularly after a hot spell. Although, given my luck with tomatoes lately, I may rethink my summer vegetable garden entirely!